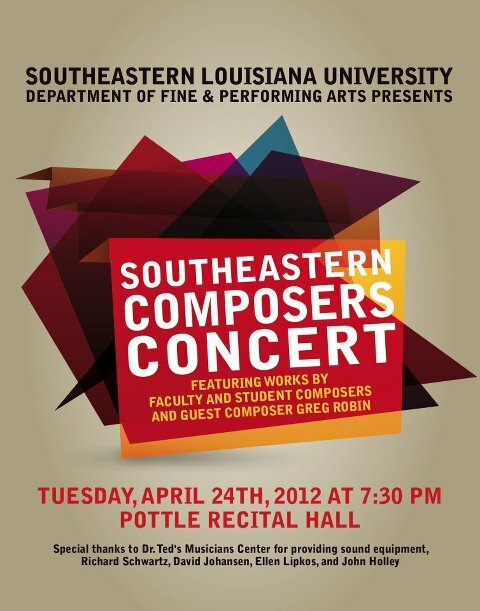 Just two days until the Composers Concert at Southeastern Louisiana University! Philip Schuessler and Richard Schwartz will be performing my piece Embers for piano and saxophone. It should be a great show, as there seems to be a growing interest in new music and composition at SLU. The concert also features works by faculty composers Philip Schuessler, Stephen Suber, and Brian Hanson, and new pieces by student composers Daniele Lesniowski, Carter McFarland, and John Holley. Oh, and we have a special guest coming to present his music at the composers forum and on the concert Tuesday, Greg Robin.